K-pop is no longer limited to idol groups and their synchronized dance moves to upbeat music: The term has broadened to encompass all genres of music from Korea. “You will be surprised to know that Korean rock is very popular in the U.S.,” said Bernie Cho, president of DFSB Kollective, a pioneer in introducing Korean indie music to the United States, during an interview with The Korea Herald on April 6. 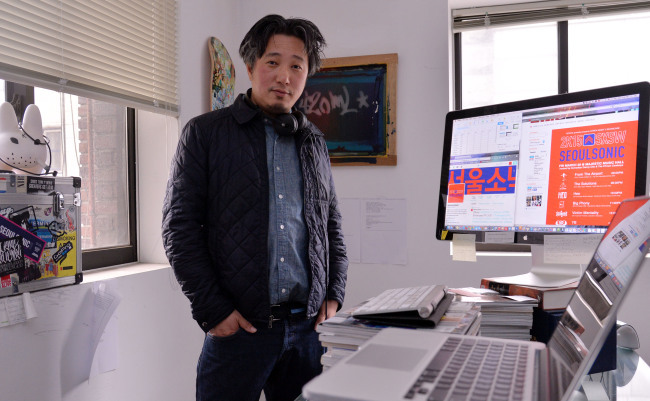 Having just returned from the U.S. where he had introduced a team of Korean musicians to SXSW in Austin, Texas, Cho described how the U.S. audiences respond to Korean artists. “Rock, EDM (electronic dance music), urban music, which includes R&B, and hip-hop did well, grabbing headlines,” he said. Marking the fifth year at the biggest music festival and conference in the U.S., the SeoulSonic stage organized by Cho featured From the Airport, Solutions, Big Phony, Heo, Victim Mentality and YB. “The SXSW festival director discovered Victim Mentality in Hongdae last year. They put on a phenomenal live show,” said Cho. Cho particularly appreciated YB for their performance at the SeoulSonic stage. “We were surprised but flattered he was headlining our bill. They are an arena act and they came to play in a club,” he said, adding that YB is a fantastic mentor of indie bands. Believing that there was safety in numbers, Cho brought a number of acts to the festival. “We put on our branded stage for Korean bands,” said Cho. That was the beginning of SeoulSonic, a stage that introduces Korean musicians from different genres. Following the performance at SXSW, the bands tour several U.S. cities. It was not lost on Cho that Texas has the third-largest Korean-American population. “We assumed that it would be safe, that there would be Korean-Americans we could fall back on, but we found that people attending our shows are not Koreans,” he said. How does he pick the bands? “I look for passion. But it is a business decision. As cool as flashy K-pop may be, the cold hard facts and figures tell us the American music market is marching to different beats. We are targeting what the U.S. market is listening to,” said Cho. Indie acts are the No. 1 best-selling artists in the U.S., followed by rock and R&B/hip-hop which share the No. 2 spot. Electronic dance music is the fastest-growing music market in the U.S.
Another requirement is that they need to do “amazing live shows.” “An amazing, intense live show transcends translation and requires no interpretation,” he noted. “The K-music mystique is that it is unique, innovative and new. And the diversity in genres is definitely the ace card for promoting Korean music overseas,” Cho said. “The Korean music market is No. 10 in the world. It is the fourth-largest net export market in the world, following the U.S., U.K. and Sweden. It really belongs to an elite group of countries,” said Cho. An aspiring filmmaker at Dartmouth College in the U.S. who switched majors to government and East Asian studies at the behest of his parents who considered filmmaking “too light,” Cho fell into the music industry by accident. “It was the summer before I was to have started graduate studies in Seoul. I crashed a party where I met a music channel owner,” he said. Soon, he was working at Mnet from where he moved onto Channel [V] and later, MTV. “Around 2007, I realized people were looking at music on devices. I felt digital media production had more potential and left the music TV industry after 10 years,” he said. “I could sense how popular Korean music was going to be but saw no bridge between business and buzz. This is how I got the idea to start an artist-friendly agency,” Cho explained. “I would love to see Korean musicians heading international festivals and not only be nominated, but win awards. My biggest fear is that K-pop will be considered a fad. I hope market conditions will improve locally, meaning more resources and opportunities to go overseas.” However, with music downloads from Korean sites costing only $0.05 per tune, things are difficult here, according to Cho. “This summer, we are expanding direct digital distribution to top 10 platforms in over 100 countries. It is exciting that we’re going to make Korean artists’ music more available worldwide,” he said.